Yo Momma Runs: Treadmills: bouncy or hard? I set up a gym date with my running friend, and we were going to try running outside after I dropped my kids off at the kids' club. Why this hasn't occurred to me as a possibility before today, I don't know. Some runner ladies from another gym mentioned doing it at their gym, and I thought, what the heck -- I'm enforcing this at our gym too. I was so sick of the gym track and treadmill that the idea of that outdoor run to me was like the idea of filling up a shopping cart with anything you want at Toy R Us to a kid (or also to me). We were even looking forward to hills. That's how crazy runners get after months of this treadmill stuff. But then there was rain. Suddenly the all-business runner in me turned wimpster and decided that the treadmill didn't look so bad. Remember last time I went running in the rain? The chafing has still not fully healed. I know you a-little-rain-never-hurt-anybody Washingtonians are shaking your north-westerner heads right now. So we went treadmill. We started off on the crappier, bouncier gym treadmills because the best ones were full. At my last PT (physical therapist) appointment, the PT I worked with mentioned that I should try running on a less stiff treadmill to make it easier on my joints, but I think that's one PT rule I'm gonna have to break. On the trampoline (because of the bounce) treadmill, 6.5 feels like 8.5. About 2 miles in, my favorite Freemotion treadmills opened up so we could move. It felt so much easier. I'm all for putting the treadmill on an incline, but I think the bounce does not simulate what I want for training. Firmer equals more road-like for my marathons. If I want soft, I'll try to take it to the trails. Also, I found the sweetest description of the first day of school in my daughter's notebook. This is exactly how I felt on the first days of school (especially because we moved a ton), and it reminded me that one person being nice or welcoming to you makes all the difference. Even as adults, this is a great lesson. The twins are lucky that they'll always have an automatic best friend wherever they go. 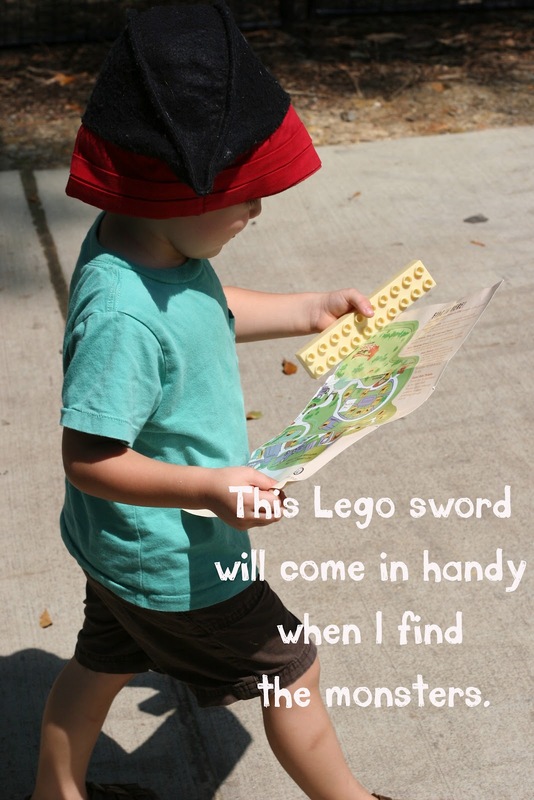 Their second best friend is their Lego sword. Lego swords are just long Legos that their minds turned into swords, and they have to take them everywhere with them. Just in case. We didn't need any swords at Fleet Feet this weekend. That place is so darn friendly. My friend Elizabeth was looking for some quality shoes to continue her exercise plans. She's like me in that she knows if she makes an investment in the right fit for her foot, it will inspire her to get out and make the best use of them. No wasted dollars! Go, Elizabeth! Do you like soft or firm treadmills? How did you feel on the first day of school? Does making an investment in running gear inspire you to get out and use that gear more often? i never really noticed a difference in treadmills. I did run on one (that was so super expensive with detailed google maps) once that felt like it was actually running for me. actually…I kinda liked that one. Now that would be a great treadmill! I was always so nervous on the first day of school. I was a wreck. Luckily my kids love it. They are alot more confident than I was. I love new gear because it does motivate me to get out there more. My son doesn't seem to mind first days of school at all either. I never run on treadmills...I hate them. Maybe if there was lightening outside ;) but otherwise I would always run outside if I could!!! You know, I kind of miss that First Day of School thing. Not the nerves etc (the little essay is so sweet) but the fresh start, the new exercise-books, the new pencil case and stationery etc. And I always invest in shoes and a bra but am a bit of a cheapie otherwise! Target special offers, those are my favourite running clothes. I've put some Oiselle shorts on my Christmas list...the long rogas. Quite excited already. I just ordered a pair of those! I'll make sure to post a little sizing assessment because I was really nervous about what size to order. Your daughter is so smart and talented. She should start a blog dishing all the dirt on her 'rents! Thanks! I'll pass that suggestion along to her. I have to say a firm treadmill is the way to go for me. This morning I had to try 3 different mills at the gym until I found one where everything was working right, so frustrating! Hate that! It's like basic equipment maintenance. If you're running a gym, you gotta stay on that. Ummm, I think I've run on one treadmill in the past several years. Once. I don't remember if it was bouncy or not! I rarely buy running hear other than shoes...um, don't kow why I'm commenting as I can't answer any of your questions! Buuuut that journal entry is super sweet! Glass she had a good first day - it can be scary! Not running on the treadmill, now that is the life! I guess I like firm treadmills a little better, though our treadmill is a bit on the softer side. I'm an outside-everyday-in-all-kinds-of-weather runner (except thunderstorms). I am terrified that I'll fly off the back of a treadmill. I just don't trust them. I love new running clothes-- mostly shirts. All of my shorts are plain black or gray so I don't have to worry about matching. As for first days of school, I loved them as a kid. I find them much more daunting now from the other side-- I'm a high school teacher. I have nightmares the two weeks leading up to the first day. Wish I could go back to those blissful, can't wait to smell the sharpened pencil days. Treadmills can be suspect! :) That's a good idea with your shorts. You have my dream job. I've always wanted to teach high school kids! Hate hate hate treadmills. I think moreso because I get so incredibly bored on them. A 6 mile run feels like a 12 miler. Due to this mindset, I have not given treadmills much time, so I honestly did not even know there was a difference (soft to hard). Will have to keep a look out this winter, if I am forced inside the gym for a run. How are you liking the Run Less Run Faster? Thinking of trying for next train plan. So far so good with Run Less Run Faster. I have some weeks added in an extra easy day of running, just to give my legs a chance to shake out. I love that they give you times to shoot for on your long runs. Bouncy or hard, the treadmill blows. I was a total keener so I loved first day of school! I think that secretly my oldest son does too, my younger one, yeah, not so much. I think that boys can turn anything into a gun/sword. It must just be in their chromosones or something? I don't even know what a keener is, but I love it. I guess I didn't realize there was a difference in treadmills, I find them all to be semi-torturous! But sometimes they're a great alternative to ick weather.